This entry was posted in Global Warming, Oceanography and tagged climate change, Delaware, IPCC, oceanography, sea level rise, weather. Bookmark the permalink. In a sense, this comment is a little unfair as it relates to a book of mine that has not been available for a couple of years and is unlikely to be made available again until sometime next year. (A very long story I will not bore you with today). There is no doubt here in the UK, (where, being an island sitting on the edge of the Atlantic Ocean, downwind of the prevailing winds, we are always driven by changing weather), we have been observing an alarming increase in precipitation. Generally, over the last decade or so, we have seen a ~25% increase in rainfall. Yes, just as with tides, there is variation; swinging between droughts to months on end of heavy rainfall. But it is clear we are observing more rain. That must, in turn, mean that the atmosphere, in locations associated with that increase of rainfall; is carrying again, ~25% more water vapour and in turn again, that the gravitational structure of the weather systems carrying that increased water vapour are carrying ~25% more mass. More mass means more gravitational effects from the increase; higher mass and thus associated higher gravity ABOVE the surface from that increased cloud mass will increase the height of any associated storm surge. That exactly the same effects as the tides are also to be observed from the increase of the mass within the clouds. That the increased mass of the clouds, must also affect the surrounding environment; that higher mass means, for the same external inputs; for example, wind and rotation of the planet; slower moving storms; longer time periods between changes within weather systems; such as we are now observing from the reported increases in the wave length of the Jet Stream. That when we look at the dynamics of weather systems, we must also take account of the increase of the mass of water vapour within the clouds; and thus, in which case, the greatest increase has not been temperature, or rising sea levels; but water vapour mass above the surface of the planet.. 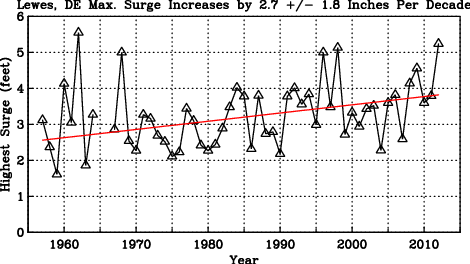 I think it may be a bit problematic to “fit” a trend line to annual storm surge maxima. Severe storms are highly episodic, and using annual max to derive a trend line may discount years in which multiple severe surge events occured. Hope you and yours were not too badly affected by the storm. A couple of points: I haven’t seen you mention that much of the US East Coast “sea level rise” is actually caused by “land level fall”. Or not. Your guess is probably better than mine. Wow – just reading that Wilmington News Journal article. 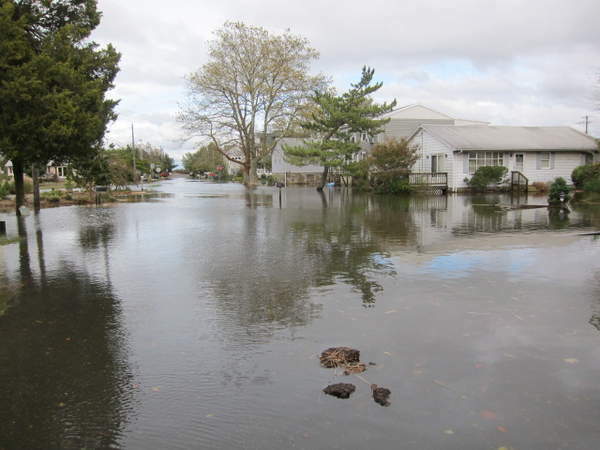 I agree with you that the Delaware shore is completely vulnerable to more storms like Sandy. It’s definitely not going to take 200 years for us to see something like this again. We’re lucky Delaware didn’t have more damage.